An Unboxed blog, from Martha Griffiths, first year student of American and English Literature at the University of East Anglia. Amongst the 110 love letters held in the Whitehorn collection at the British Archive for Contemporary Writing from Doris Lessing to her wartime lover, perhaps one gives us a greater insight into her young life, and the society she grew up in. It was written to John R. M. Whitehorn, an RAF serviceman and intimate confidante and is dated sometime around January 1945. This letter perfectly captures Lessing’s determination to make her own choices and express herself and her emotions towards others. It describes her relationship with both her husband and the other men that she met, mostly through Communist Party meetings. Not only is she writing to a long-term lover about her husband, but she also describes the “platonic amour” she has met recently. To many, this flirtation may come as a surprise or appear scandalous but, as she would come to say in later interviews, it was just something one did in those times. She even joined the Communist Party out of boredom, a feeling shared by many of the RAF soldiers she met there. There is genuine affection in the note towards Whitehorn, but Lessing makes it clear that it would be an unfortunate man who attempted to interfere with her choices. This was a woman to be reckoned with; she was totally self-aware and comfortably content to make her own choices. Lessing’s works are known for pushing boundaries and she lived her life to the same beat, whilst aware of her husband’s discomfort with her social life she was not willing to give in to the pull of domesticity. Today we received two new letters written by Doris Lessing to an old wartime lover and friend, John Whitehorn. The two corresponded in the 1940s when Lessing was still in Southern Rhodesia and writing her first novel. Those fascinating letters – which number over one hundred – are already held at the University of East Anglia http://www.uea.ac.uk/bacw/lessing. The two new additions date from 2000 and were discovered by John Whitehorn’s stepson, Francis FitzGibbon, who came across them in some old files. The letters are written when Lessing was awarded the Companion of Honour. She accepted this award, having declined an OBE on numerous occasions, saying to the media at the time that she liked the title because “You’re not called anything – and it’s not demanding. I like that.” She describes her visit to Buckingham Palace, including her interaction with the Queen and a lady in waiting, with characteristic wit and is unable to take the accompanying pomp and circumstance seriously. The letters will be added to our substantial collection of Lessing’s private correspondence, gifted to the University in 2008. A larger collection, received as a bequest in 2013, is embargoed during the writing of Lessing’s official biography. ‘What catapulted you into space?’ Asks Professor Christopher Bigsby when interviewing Doris Lessing for the last time at UEA’s Literary Festival in November 2007. He was referring to Lessing’s move from realism into ‘space fiction’ which he identified as beginning with Shikasta. Actually, it began sooner, she says, with Memoirs of a Survivor. Undergraduate students of the University of East Anglia’s literature module New World: Science Fiction and Beyond have been reading Memoirs of a Survivor, first published in 1974, along with other writers as they investigate different modes of science fiction and their definitions. They visited the British Archive for Contemporary Writing at the University of East Anglia for part of their seminar on Doris Lessing where they were introduced to archive material including audio and video interviews and private papers deposited by Lessing at UEA in 2008. Amongst the collection is correspondence with fellow writers Kurt Vonnegut and Brian Aldiss. The response of the mainstream literary establishment towards science fiction is a regular subject. Lessing attended the World Science Fiction Convention in 1987 as Guest of Honour and wrote to the Independent newspaper wondering why such rich discussion did not see any coverage. Amongst the file is her conference badge, a fictional piece on a nudist camp for the programme – welcomed by the publications committee, her speech notes and a long list of writers who influenced the author’s ‘space fiction’. In a file of correspondence from Octagon Press there is a letter from Sweden where the Swedish translation of Memoirs of a Survivor was influencing social policy in dealing with deprived children. There are also letters from academics and friends discussing their response to the novel. The students had identified various political, spiritual and feminist themes in Lessing’s work. In these unique primary sources, they found echoes of the various debates they have been grappling with, together with new insights – such as her use of myth and the influence of Sufism. They enjoyed hearing Lessing’s take on what was happening in publishing and literature. The only complaint from students was not having long enough to look at the material. It’s also on their doorstep – so hopefully they’ll be back soon. “I can’t be bothered to switch to a computer at my age, though I might get along with e-mail, which sounds appealing.” So said Doris Lessing during an interview with Jonah Raskin of The Progressive, before her 80th birthday. 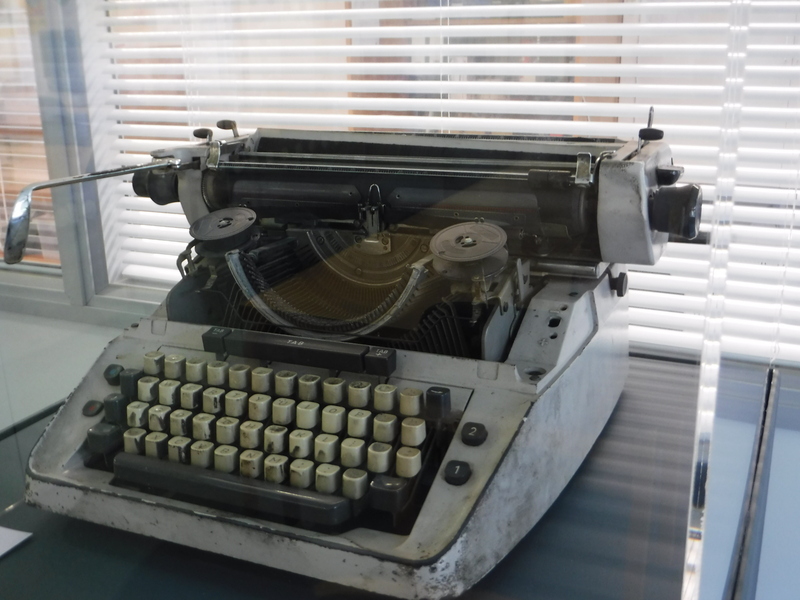 Doris Lessing’s typewriter, an Adler from the 1990s, is now on display within our Archives Reading Room at the British Archive for Contemporary Writing. Visiting researchers, even those not remotely interested in literary archives, have been struck by its presence – as if Doris herself were peering over their shoulder. If the machine is from the 1990s Lessing may have used it to write the two volumes of her autobiography: Under my Skin and Walking in the Shade. There is a brief description but it is the machine’s appearance and its general condition that tell the real story. Unsurprisingly, given how prolific Lessing was as a writer and correspondent, the keys have the look of being absolutely hammered. There are smudges of ink obscuring some of the letters. The ‘door’ leading to the ribbon is missing. Here lies a typewriter that has been well and truly worked over. Lessing had mastered the typewriter at home as a teenager while writing early fiction. She then went on to earn a living as a typist, both in Southern Rhodesia and in London. She typed virtually all personal correspondence and only handwrote in notebooks and diaries. Just as well – friends complained bitterly at what they termed ‘unreadable’, a scrawl she herself had difficulty deciphering. In her final interview, at the UEA’s literary festival in 2007, shortly after the announcement of her Nobel Prize for Literature, she described the experience of handwriting an early, unpublished novel as a key lesson – writing it long hand, at speed, and then unable to read it back. Lessing’s official biographer – the historian, Patrick French – has privileged access to those handwritten pages and is taking up the challenge. His experience of reading 19th Century cross hatched letters may well come into its own. The British Archive of Contemporary Writing holds collections of Doris Lessing’s personal archive www.uea.ac.uk/bacw/lessing including correspondence and other working papers. 30 boxes of material are open for consultation (the vast majority is typewritten!). A further 60 boxes remain embargoed during the writing of Lessing’s authorised biography.